Tecno F1 Google /FRP Lock Remove/Bypass/Skip On Oreo V8.1.0 Without Pc /2019 New Method. 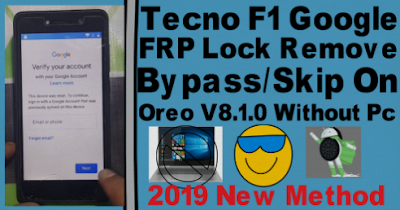 Remove Tecno F1 FRP Lock Required File. 2# Download Google Account Manager V8xxApk. Remove Tecno F1 FRP Lock Method. 5# Go to Massage types (www.youtube.com)send it. 7# Now google crome browser will be opend. 9# Go to Download Google Account manager V8xx & Quickshort cut maker apk file. 10# Google Account manager install it then again install Quickshort cut maker and open it . 11# Search Google Account manager and open it. 12# Now Login New gmail and password. 14# Click next more time. 15# Go to setting and remove gmail..
16# Go to about phone and enable OEM unlock. 17# Now your phone tecno f1 frp bypass complite.